WARNING: Do not proceed with any of these steps unless you have the ability to restore a bare-metal backup. Everything I'm doing has the potential to trash all of the data on your computer, requiring a clean installation of macOS and subsequent data recovery from backups. I use a combination of Time Machine, CrashPlan, and Arq to back up my system, you should too. If you're interested in triple booting your MacBook Pro, and Windows is going to be one of the Operating Systems you're going to boot, then take my word for it, this is the only way you want to accomplish this feat. To be fair, a lot of my instructions and the guide I initially followed, can be found here. However, several of the steps in that guide I didn't have to use at all, so I'm documenting my process here. Apple's official documentation for Boot Camp is found here. Follow Apple's instructions for installing Windows, but make sure you create the Windows partition approximately 64GB larger than what you want to end up with for Windows, that space will end up being given to Linux. 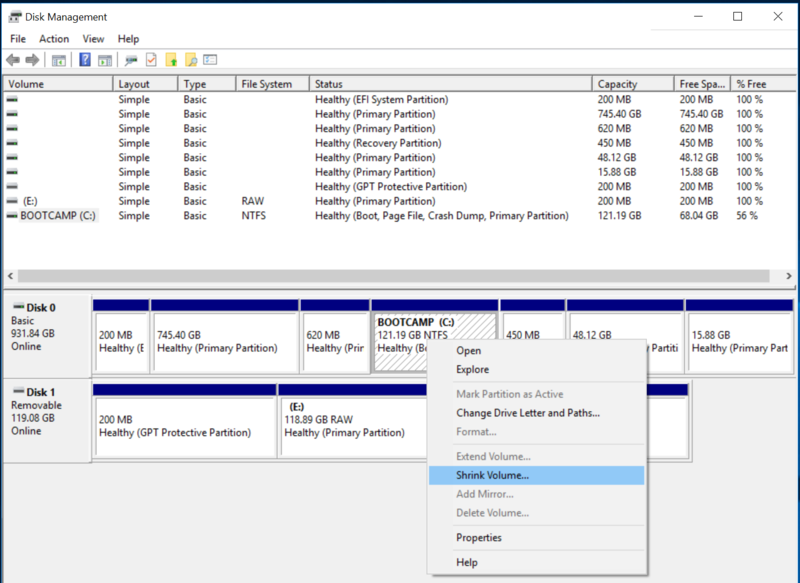 Adjust if you wish, I used a 196GB partition for Windows 10, then split it into 128GB for Windows and 64GB for Linux (FYI, a Windows 10 installation with Office 365 installed takes up 68GB, so give yourself enough room under Windows). Note: Apple only supports Windows 8.1, or newer, for hardware released after 2014. There is no way to install an earlier version of Windows using Boot Camp on newer hardware. See this table to check your hardware and what versions of Windows are supported on it. Now that you have an Apple-supported dual-boot system running macOS and Windows 10 (presumably), it's time to perform the Linux installation. For the purposes of this article, I'm going to install Kali Linux, that's what I used, but installation with ANY version of Linux should work the same way. This image is AFTER I did my initial shrink and subsequent installation of Kali linux, you'll have fewer partitions when you do this. I also have an SD card mounted. The shrinking process took a LONG time (~30 minutes), don't worry about it, let it run to completion and do not interrupt. Place all of the rEFInd files (after unzipping) on a removable volume (SD Card, USB drive, or even a secondary HFS+ volume) so you can use it in the next step. Full installation instructions can be found on the rEFInd site. You may also want to theme rEFInd to look more "mac-like". I used the OSX Standard Theme 1.0 found here. Test that rEFInd is installed and operational. Just reboot and you should be taken to the rEFInd boot menu, from there you should be able to boot into either macOS or Windows 10. Note: rEFInd will automatically find what it believes to be bootable volumes. They probably all won't be bootable, through trial-and-error you should be able to find the correct macOS and Windows 10 volumes. You can then configure rEFInd to ignore some volumes, but save that for after you have everything working properly. Boot into macOS and have a USB key available to be reformatted, it can be pretty small (small works better), an 8GB drive is perfect. Alternatively, if you want a graphical imaging process, you can use UNetbootin as documented here for Ubuntu (just use Kali or whatever image you want). You're now ready to install Linux. The reason you had to install rEFInd before installing Linux was that, in my experience, I could not get the standard macOS boot manager to recognize the USB drive I had prepared with Kali Linux. However, if you reboot now, you'll see the rEFInd boot menu. You can then insert your USB drive, then hit ESC to refresh the volumes and you should see the Linux installation drive appear. Select it for booting. Follow the instructions for installing Linux, making sure to select the correct partition that you created while you were under Windows 10 earlier. You should now have a triple-booting MacBook Pro. Using rEFInd you can select the appropriate OS and it should boot cleanly on your hardware. In the event that rEFInd gets clobbered (you'll know, because a power-cycle takes you to the built-in macOS boot manager) you should still be able to boot into Windows, but you'll probably lose the ability to boot into Linux. Just follow the instructions and re-install rEFInd again and it should come back and allow you to boot again.